The dress may be a summer staple, but that doesn’t mean you can’t wear it in winter. 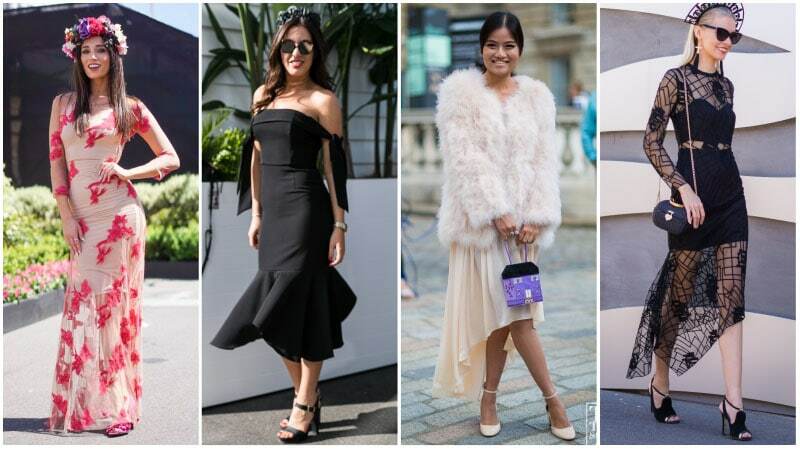 In fact, dresses can make an excellent option during the chilly season and provide a stylish alternative to pants. So, if you’re sick of wearing the same old jeans and trousers every day, it may be time to embrace the winter dress. While you may be worried that you’ll freeze going pants-free at this point in the year, you needn’t be concerned. 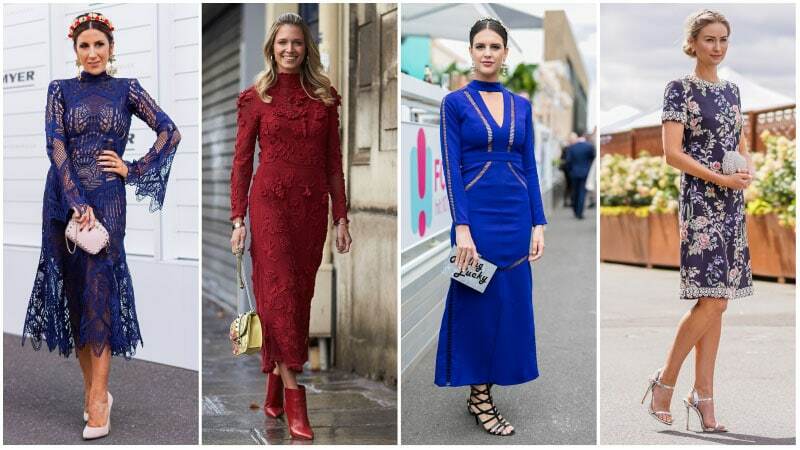 By choosing the right types of winter dresses and employing smart styling and layering ideas, you’ll be feeling cosy while looking chic all season long. When it comes to choosing a winter formal dress, striking a balance between fashion and function is important. While you want your dress to appear stylish and elegant, you also need it to keep you somewhat warm. As such, a floor-length gown with long sleeves and a high neck is an excellent option. If the weather is severely cold, you can always take a faux fur jacket with you to travel to and from the event in style. Finding the perfect dress to wear to a winter wedding can be a challenge. Not only does it need to be beautiful, but it also must be seasonally-appropriate. A long-sleeved, lace, midi can make an excellent option for formal events at this time of the year. Just remember to select one in a wonderful winter colour, such as navy or crimson. Baby showers are the perfect place to embrace a feminine style of dressing. So, while you may be used to wearing black all winter, it’s best to leave the dark shade at home for this event. Instead, consider rocking a light, pastel hue or white. A white midi dress in a lace fabric can make a particularly chic and stylish choice. Just choose a design with long sleeves and partner it with a scarf to help stay warm. 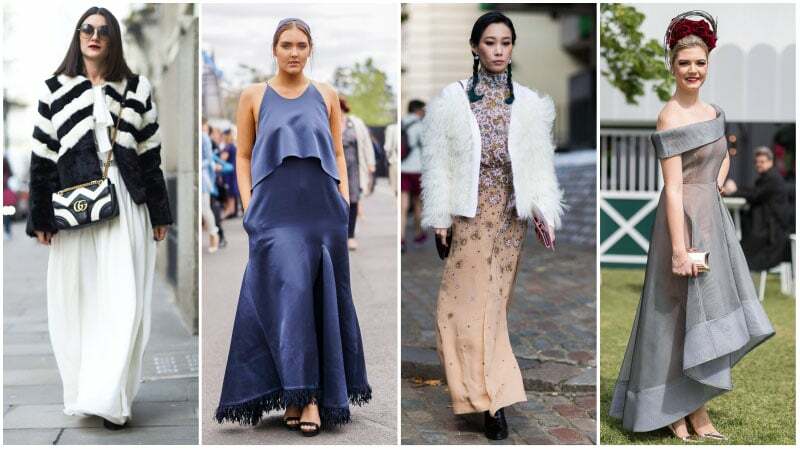 While maxi dresses may be your go-to for breezy summer style, they can also be an excellent addition to your winter wardrobe. If you like the look of a billowy, printed maxi, simply select one with a dark base colour. Then, pair it with seasonal items, such as a leather jacket and black booties. Alternatively, consider rocking a knitted column maxi for a cosy and casual appearance. You’ll feel like the belle of the ball this season with a stunning winter gown. Just remember to choose one with plenty of coverage to keep you warm. One with a long length and high neck will be perfect. Selecting a design in a cool colour, such as blue or grey, can also provide a stylish and seasonally-appropriate touch. Don’t forget to add a little drama as well. While daring low necklines and thigh-high splits provide excitement in summer, winter is all about embellishments and enhanced details. Are you heading to a cocktail party this winter? A little black dress can be a perfect choice. Just remember to select one with enough coverage to keep you warm. A style with long sleeves and a high neckline will keep your upper body toasty while showing off your lovely legs. Alternatively, if you wish to wear a strapless or off-the-shoulder dress, consider opting for a longer length or adding a coat to your outfit. When you’re heading to a party, it’s always fun to wear a dress. However, when said party is in the middle of winter, putting on a pretty party frock tends to be the last thing you want to do. To combat this issue, try choosing a dress that won’t leave you shivering. One with long sleeves, a high neck, and a length that finishes at the knees will provide you with protection and comfort. Also, don’t forget to take a matching coat to keep you extra warm when needed. For a cute and casual winter outfit, a dress can make an excellent option. 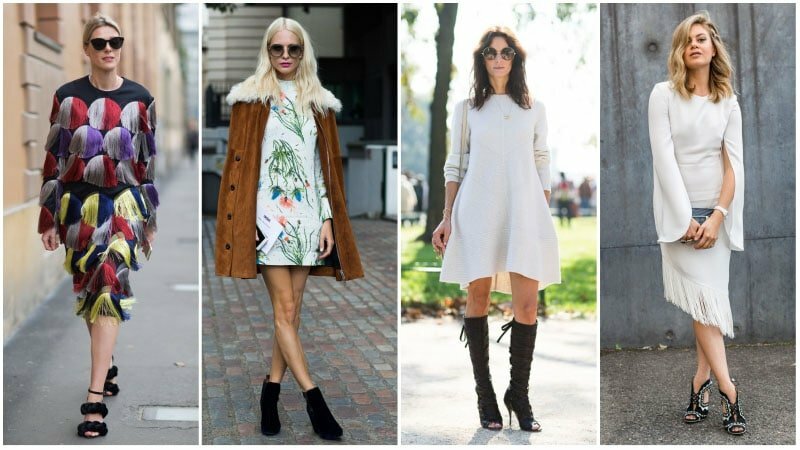 In particular, knitted dresses are perfect for the season. Not only are they stylish and sweet, but they’re also comfortable and seriously cosy. 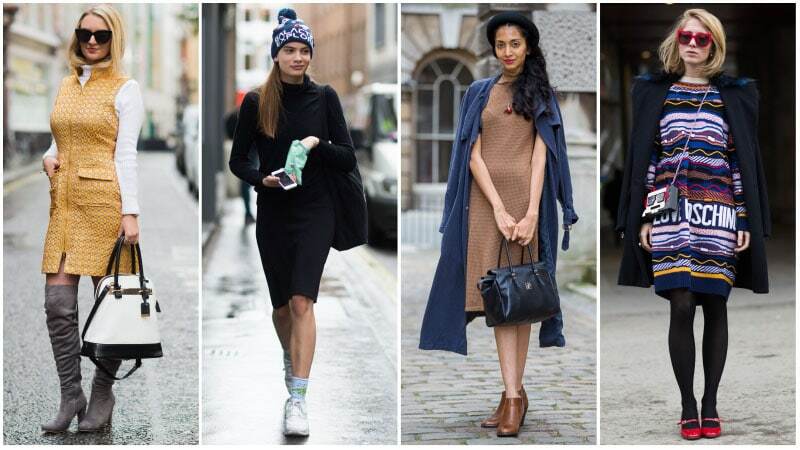 Pair a sweater dress with ankle boots, a trench coat, and a beanie for a fantastic winter ensemble. You can also consider adding stockings if the forecast looks extra frosty. If you wish to wear a short dress to your winter formal, you can. But, be sure to choose one with long sleeves and a high neck to avoid looking and feeling too exposed during the chilly season. Also, remember to think about fabric before selecting a dress. Thicker materials will provide more warmth and protection than those that are thin and light. When it comes to shoes, opt for closed-toe heels to keep your feet a little warmer and looking winter-appropriate. Rocking a dress in winter requires a little preparation so that you feel comfortable and warm. Firstly, you need to choose your dress wisely. Opting for styles in thick materials with long sleeves and high necks will help keep the cold away. A longer length will also aid in protecting bare legs from the wind and frosty air. After you’ve chosen your dress, it’s time to start layering. Stockings, high boots, pants, sweaters, shirts, jumpers, jackets, coats, scarves, and hats can all offer extra warmth where needed. Select styles with more coverage, such as those with long sleeves and a high neck. Stick to thick fabrics that offer more warmth. 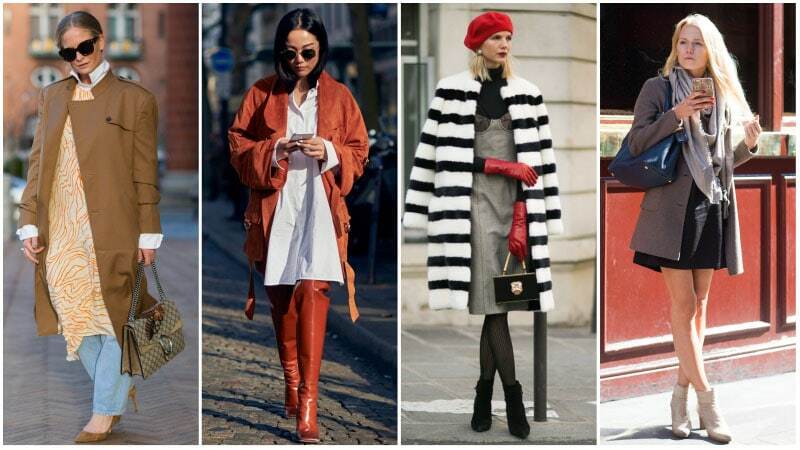 Layer both over and under your dress with items like a coat, stockings, long boots, a turtleneck sweater, etc. Choose a knitted dress for a cute and casual look. For formal events, select a dress in a seasonally-appropriate colour, such as black, navy or red. Utilise embellishments, unique materials, and special design details to add excitement to your outfit without revealing skin.